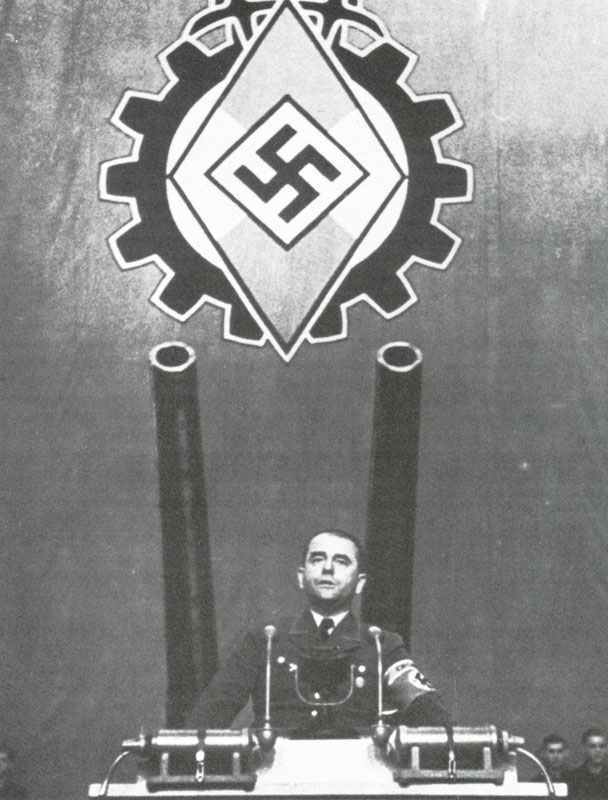 Albert Speer is speaking to workers. In two years he was able to quadruple the German armaments and munition production, despite Allied bombing and the loss of important raw material areas. Germany: Todt, Minister of Armaments and Munitions, killed in air crash at Rastenburg, East Prussia; aged 50. Professor Albert Speer becomes Minister of Armaments and Munitions. Philippines: Bataan garrison finally annihilates remnants of 2 Japanese battalions which had landed on rugged west coast of the peninsular in late January. Casualties (killed): Japanese, 900; Americans and Filipinos, 500. Roosevelt rejects proposal that Philippines should be declared an independent neutral state. Malaya: Japanese land on Singapore Island (night February 8-9) and capture Tengah airfield. Pacific: Japanese land at Makassar (Celebes). Japanese troops occupy Gasmata, New Britain. Pacific: Japanese bomb Surabaya (51 killed, 54 injured).